Question 1: Which of the following pairs will give displacement reactions? (a) NaCl solution and copper metal. (b) MgCl2 solution and aluminium metal. (c) FeSO4 solution and silver metal. Question 2: Which of the following methods is suitable for preventing an iron frying pan from rusting? Question 5: You are given a hammer, a battery, a bulb, wires and a switch. By beating the samples with hammer we can check its malleability. If the sample is malleable then it is a metal otherwise non-metal. 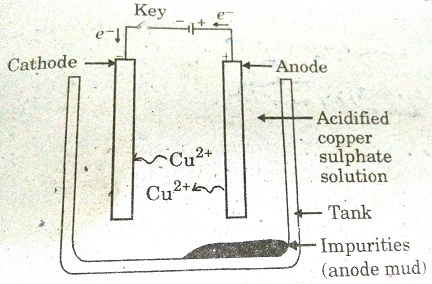 Similarly, we will make a circuit as shown in the figure and check the electrical conductivity of the sample. If with the sample (test material), the bulb glows on turning the switch on, the sample is likely to be a metal otherwise a non-metal. (b) The above tests are generally useful in distinguishing between metals and non-metals. Since, these are based on only physical properties and no chemical reaction is involved in these tests. Only exception is graphite which is a good conductor of electricity although it is a non-metal. Question 6: What are amphoteric oxides? Give two examples of amphoteric oxides. Another example of amphoteric oxide is - Zinc oxide. Question 7: Name two metals which will displace hydrogen from dilute acids, and two metals which will not. Answer: Metals that displace hydrogen: Magnesium, zinc. Metals that do not displace hydrogen: Copper, gold. Question 8: In the electrolytic refining of a metal M, what would you take as the anode, the cathode and the electrolyte? In this process, the impure metal is made the anode and a thin strip of pure metal is made the cathode. A solution of the metal salt is used as an electrolyte. The apparatus is set up as shown in the above figure. Question 9: Pratyush took Sulphur powder on a spatula and heated it. 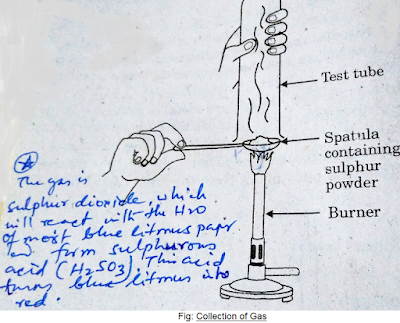 He collected the gas evolved by inverting a test tube over it, as shown in figure below. Answer: (a) (i) No effect on dry litmus paper. (ii) Turns blue litmus red in moist state. 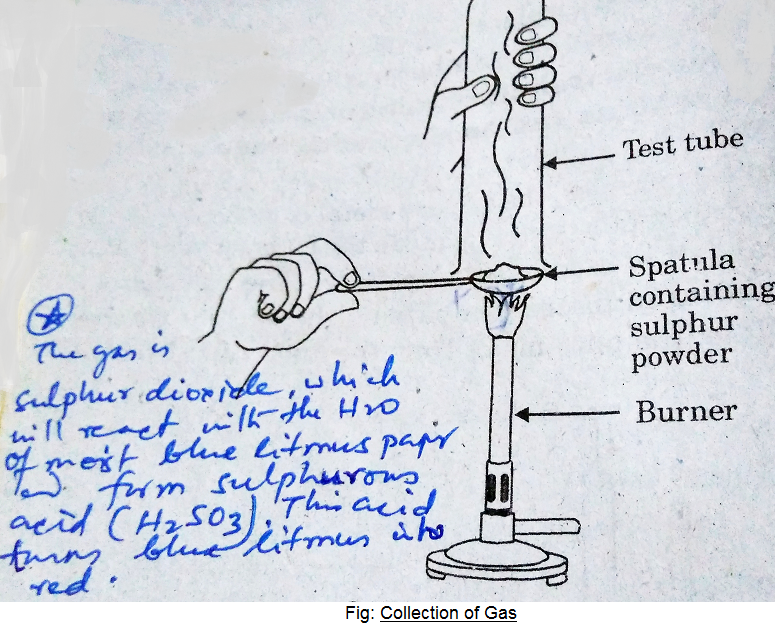 The gas is Sulphur dioxide, which will react with the H2O of moist blue litmus paper and form sulphurous acid (H2SO3). This acid turns blue litmus into red. Question 10: State two ways to prevent the rusting of iron. 1. Galvanisation: A method in which a coating of zinc is made on the iron article. 2. By applying a coating of paint or grease or oil on the iron article. Question 11: What types of oxides are formed when non-metals combine with oxygen? (a) Platinum, gold and silver are very less reactive and do not corrode. They also possess very brilliant lustre due to which jewelleries made with these metals look beautiful. (b) Metals such as potassium, sodium and lithium react with air so vigorously that they catch fire if kept in the open. Hence, to protect them and to prevent accidental fires, they are kept immersed in kerosene oil. (c) In spite of being a highly reactive metal, aluminium does not corrode easily. This is because aluminium reacts with oxygen present in air and forms a thin layer of aluminium oxide. This layer of aluminium oxide is very stable and thus, prevents further reaction of aluminium with oxygen. It is also a very good conductor of heat and light in weight. Because of the above reasons aluminium is used to make utensils for cooking. (d) It is easier to obtain a metal from its oxide, as compared to its sulphides and carbonates. Therefore, prior to reduction, the metal sulphides and carbonates must be converted into metal oxides. Question 13: You must have seen tarnished copper vessels being cleaned with lemon or tamarind juice. Explain why these sour substances are effective in cleaning the vessels. Answer: It is because the basic oxides of copper like - copper oxide and copper carbonate formed on the copper vessels react with the acid present in the sour substances like lemon and tamarind and get dissolved and removed. Hence, lemon or tamarind and similar sour substances are used to clean copper vessels as they remove the corroded part of copper vessels and pure copper is exposed. Question 14: Differentiate between metal and non-metal on the basis of their chemical properties. Metals are positively charged ions (cation). Non-metals are negatively charged ions (anion). They react with the oxygen to form basic oxides. They react with the oxygen to form acidic or neutral oxides. Metallic oxides have Ionic bonds. Non-Metallic oxides have Covalent bonds. Metals also form amphoteric oxides after reacting with oxygen. (Some metal oxides are amphoteric oxides). Non-metal oxides are not amphoteric oxides. Metals react with water to form oxides and Hydroxides. Some metals react with cold water, some with hot water while others with steam. Non-metals do not react with water. They react with dilute acids to form salt and hydrogen gas. Exceptions: Cu, Ag, Au, Pt, Hg. They react with the salt solution of non-metals. Metals are generally reducing agents. Since, they can easily loose electrons. Non-metals are generally oxidising agents. Since, they can easily gain electrons. Question 15: A man went door to door posing as a goldsmith. He promised to bring back the glitter of old and dull gold ornaments. An unsuspecting lady gave a set of gold bangles to him which he dipped in a particular solution. The bangles sparkled like new but their weight was reduced drastically. The lady was upset but after a futile argument the man beat a hasty retreat. Can you play the detective to find out the nature of the solution he had used? Answer: The solution which the goldsmith used was aqua regia. It is a highly corrosive liquid and dissolves the gold in it. Question 16: Give reasons why copper is used to make hot water tanks and not steel (an alloy of iron). Answer: Copper doesn't react with water. But iron reacts with steam. So, if hot water tanks are made of steel which is an alloy of iron, then its iron content will react with steam formed from hot water. That is why, copper is used to make hot water tanks and steel is not.